Gardening and landscaping involves planning before getting your hands in the soil. Once the gardener has completed those actions, he or she still has to additional tasks to complete. Those tasks are the focus of this week’s column. A neglected garden probably motivated the landscape renovation project. Neglect often includes trees and woody shrubs that have outgrown their space, lack a role in the new design, or are unhealthy. In some cases, this task will require contracting with an arborist or laborers. Check local ordinances before removing trees. Removing weed plants with a do-it-yourself approach could be time-consuming and frustrating. Consider contracted services to get the job done quickly and thoroughly. If your garden includes paving, e.g., sidewalk, patio, walls or outbuildings that are not included in the new design, remove them to free your progress. Again, consider contracted services to speed the work. This would be a good time to invite a disinterested friend to comment on your garden accessory collection, and to remove items that are no longer assets. The gardener should know the structure of the garden’s soil. An ideal soil would have 45% minerals (sand, clay, silt), 5% organic material (plant and animal), 25% air and 25% water. 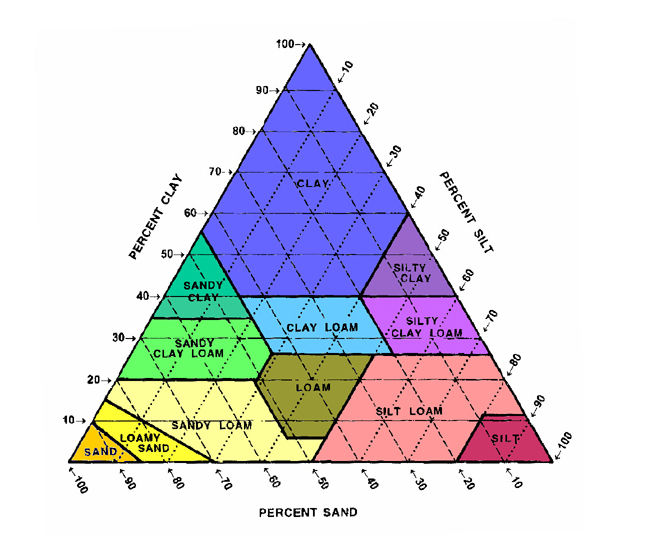 The Soil Texture Triangle illustrates various combinations of sand, clay and silt that might be found in a garden. The mineral content of ideal garden soil, called loam, should be about 40% sand, 40% silt and 20% clay. A simple method to analyze your garden’s soil texture, involves placing a sample of your soil in a jar with water, shaking and then letting it settle into density layers. Here are Organic Gardening’s brief instructions for a soil texture test. Also, check out this helpful article by the Marin Master Gardeners. Notice that these preparations do not include buying plants! For many gardeners, the primary strategy for improving the landscape is to buy plants. That approach, without an overall plan, weakens the landscape design and wastes time and money. Enjoy your preparation! The fun stuff (selecting and installing plants) comes next. This entry was posted in Essays 2014, Spring Quarter and tagged landscaping, soil texture, solarization, Weeds by tomkarwin. Bookmark the permalink.